As a kid and teen, I spent a lot of my crafting time doing cross-stitch. Cheesy kits with "Grandpas are the greatest" and kid-ccentric cartoon characters. Cute as a child and nice gifts for the family when you're young, but as an adult, the cross-stitch and embroidery arena is sorely lacking a modern feel. Until I discovered Sublime Stitching. 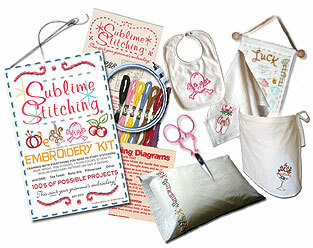 I ran across this awesome company over at Mod Podge Rocks when Amy did a review of one of the Sublime Stitching books. I was intrigued so I visited the website and was immediately enthralled. This small, handmade business is run by Jenny Hart and her tagline "This ain't your gramma's embroidery" says it all. After perusing her products and her extremely easy-to-follow how-to's, I knew I had to jump in and get started. I have a small collection of embroidery floss and the stray needle from my previous experiences, but I decided to purchase the Ultimate Embroidery Kit just to make sure I had everything I needed for my first go. 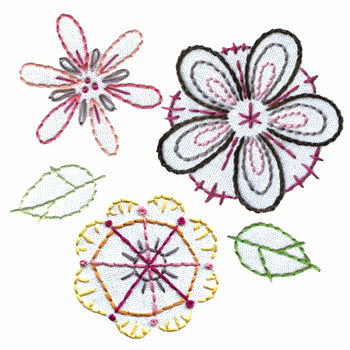 The kit comes with everything you need, plus your choice of pack of patterns, embroidery floss and textile. Jenny has an amazing assortment of patterns and I chose the Fantasy Flowers pattern set and a tea towel as my textile. Since receiving the kit in the mail, I have tansferred my patterns to the tea towel and begun my embroidery adventure. The process is so easy thanks to Jenny's ridiculously simple and easy-to-follow instructions. I decided to fill the tea towel with as much pattern as possible and frame it as art instead of actually using the towel. It's becoming too pretty to dry my hands with and send through the wash a million times. I will be sure to share my creation once it is complete. I encourage you to check out Sublime Stitching and even if you have never picked up a needle before in your life, you will be an embroidery master in no time, and officially obsessed.